World Mercury Project Thimerosal, a mercury-containing preservative, is still in 48 million U.S. flu vaccines each year, tetanus toxoid, meningococcal vaccines and, in massive doses, in the pediatric vaccines given to 100 million children across the developing world. A Centers for Disease Control (CDC) review published last month found that the ethylmercury in thimerosal is as profoundly neurotoxic as the heavily regulated methylmercury in fish. 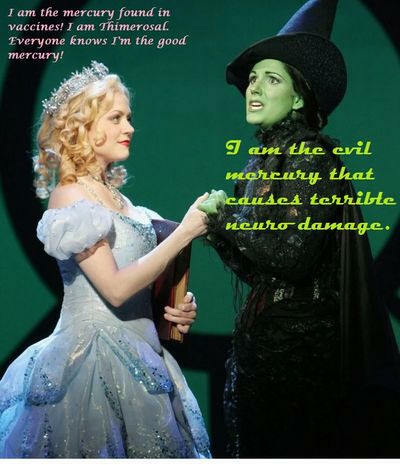 ''I had no clue about the pivotal role they both had played in deceiving the public about thimerosal safety. Both of them spoke to me willingly. Offit expressed admiration for my father, which is an effective way to butter me up. I asked them both the obvious question: "Why do we advise pregnant women to steer clear of fish because of neurotoxic mercury and yet inject much larger doses of mercury into pregnant women and babies?" They both repeated to me the thread worn industry canard that the "ethyl mercury in vaccines is not as dangerous as the methyl mercury in fish" which everyone admits is highly neurotoxic. Offit explained to me that ethyl mercury wasn't toxic because it leaves the human body so quickly. Take Another Look : An Interview with ‘Trace Amounts’ co-director Shiloh Levine I learned that Ethylmercury is not the “safe mercury,” which a lot of people like to spout in the media. It is actually more dangerous than Methylmercury, which is the type of mercury found in fish. And it gets trapped in the brain twice as much as Methylmercury and that’s where the neurological problems are....Two parts per billion is the amount of allowable mercury in our drinking water. Two hundred parts per billion is considered toxic waste. Fifty-thousand parts per billion is the amount of mercury in Thimerosal at twenty-five micrograms. In a flu shot, that amount is fifty thousand parts per billion, which is twenty-five thousand times more than the allowable amount in drinking water. You’re injecting toxic waste into babies and pregnant mothers, and that’s not okay. [2011 Sept] The Vaccine Establishment’s SAFETY Debate: Use of Thimerosal in vaccines Versus the admittedly dangerous use of methylmercury these studies, as brought to light by Dr. King, establish that ethylmercury (Thimerosal), a “supposedly harmless” compound of mercury according to the vaccine establishment, is converted in the rat  and apparently in the human infant  into “methylmercury” which, the establishment admits is a harmful form of mercury. Several pages of the paper examine the toxicity of methylmercury and its past use as a fungicide. We are led to believe that this form of mercury is much different than ethylmercury, the type found in vaccines. This is in spite of the fact that ethylmercury was used for the same purpose. In fact, Ethylmercurric Chloride, the material used as a fungicide (which was banned long ago) is what is used to make thimerosal. This can be easily confirmed by looking in a Merck Index. We now know that this type of mercury deposits twice as much inorganic mercury in the brains of primates as compared to equal doses of methylmercury (4). Inorganic mercury, following the de-methylation of organic mercury, has been identified as the primary neurotoxic agent in primate studies (5). The author mentions the book, "Evidence of Harm: Mercury in Vaccines and the Autism Epidemic" by David Kirby. It contains 436 scientific references. The author did not disclose if he read the book. This may have helped his argument since this book was read by many parents of autistic children. (4) Burbacher T, Shen D, Liberato N, Grant K, Cernichiari E, Clarkson T. 2005. Comparison of blood and brain mercury levels in infant monkeys exposed to methylmercury or vaccines containing thimerosal. Environmental Health Perspectives. 113:1015-1021. LES INCOMPETANTS: OPEN LETTER TO THE AAP By K. Paul Stoller, M.D. …A second study, which was not discussed this morning, is that adult male and female rats were administered five daily doses of equimolar concentrations of ethyl or methylmercury by gavage and tissue distribution, neurotoxicity, and nephrotoxicity assessed. This was a Magos study in 1985 in the Archives of Toxicology. 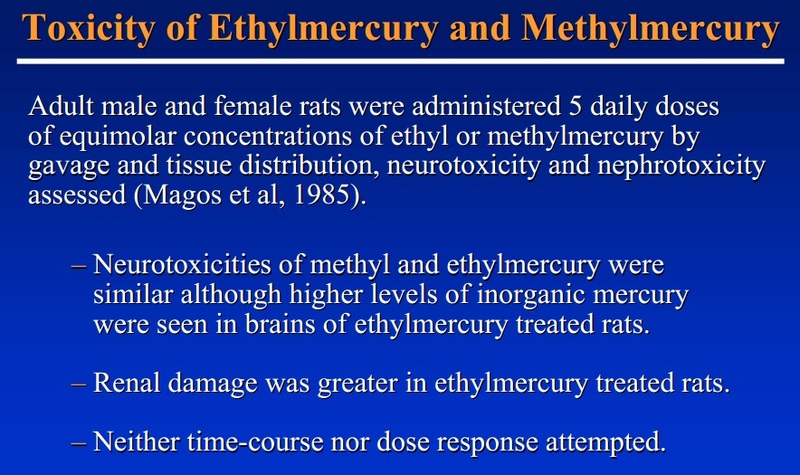 And the key points of that paper were: neurotoxicity of methyl and ethylmercury were similar, although higher levels of inorganic mercury were seen in the brains of ethylmercury-treated rats consistent with what we'd said about metabolism; and likewise, because of that, the renal damage was greater in the ethylmercury treated rats. …I think it is important to note from the Magos study, in which he directly compared ethyl and methylmercury, that he found essentially the same results in both studies, with the exception that the renal toxicity was greater with ethyl, and I think that was because of the demethylation as a way of concentrating the mercuric chloride or inorganic mercury in the kidney.